Hans Goto Sensei has over 40 years of experience in the martial arts. His main focus has been Aikido, with extended residential training in Iwama, Japan, under Morihiro Saito Shihan. Goto Sensei was one of the first foreign students admitted to study at the Iwama Dojo. 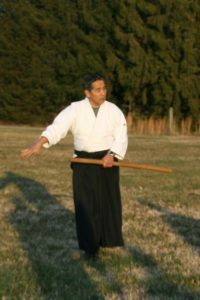 Goto Sensei is Head Instructor and founder of Bay Marin Aikido and serves as President of the Takemusu Aikido Association. He has published in Black Belt and other periodicals. We will celebrate with our annual holiday party Saturday night. All styles welcome!